Facebook has chosen the UK as the first country outside the US to get its Messenger payments service. Later on Monday, local users will be able to send each other money in a message. The service was launched in the US in 2015. The social network says it has been widely used to split restaurant bills, pay babysitters and simply send gifts. 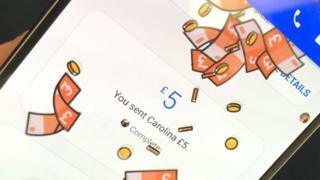 It says most users send less than $50 (£38). The company says the service is coming to the UK because it has so many "mobile-savvy consumers". Facebook is collaborating with all the major banks and credit card firms to launch Messenger payments, which will require both the sender and recipient of money to register their payment cards. But three years ago, UK banks launched their own instant payments service - Paym - which has not made a huge impact on the way we pay. So, why should this be any different? Facebook claims Messenger payments will catch on because "people are looking for simplicity and emotion". I'm not sure about the emotion, but the Messenger app is certainly a very simple way to send money, especially compared with Paym where you have to log in to your own bank's app. David Marcus, who runs Messenger, says it is obvious from our messages that we need this. "More and more people are having conversations on Messenger about paying one another," he explains. "As a result it's a very natural place for you to have the most frictionless and secure way of paying each other." Facebook is also introducing something called M suggestions, a virtual assistant that recognises when you are talking about payments. It will suggest the new service as a quick and easy solution. We'll see how users enjoy being nudged in this manner. But with millions of Messenger users, who will not need to download a separate app to use the service, Facebook is well placed to become major player in the UK payments scene. That begs the question, how did UK banks let this happen? A spokesman for Paym insisted it was growing, with four million people having registered their mobile phone numbers to use the service. But with just £400m of payments in three and a half years, it is still a minnow. Image caption What's easier? Cash, or a digital payment? In Sweden, by contrast, Swish - a peer-to-peer payments service in a single app - has taken the country by storm with the majority of adults now "swishing" money to each other and small businesses. The UK payments industry decided against a Paym app, believing customers would be more likely to trust their own bank's online operation. But it looks as though the lesson from Sweden - and from Facebook - is that simplicity is vital to building the network effect needed to make a new service take off. But perhaps we should be cautious before allowing Facebook into yet another part of our lives. While the Messenger service is free to use, the business model behind it is all about "engagement" - keeping users on the platform for longer so that they can be served more advertising. At a time when there is growing alarm over the extraordinary power the social media giant has to mould the way we see the world, letting it peer into our wallets as well may be a step too far for some.